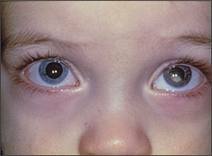 Leukocoria (also leukokoria or white pupillary reflex) is an abnormal white reflection from the retina of the eye. Leukocoria resembles eyeshine, but leukocoria can occur in humans and other animals that lack eyeshine because their retina lacks a tapetum lucidum. Leukocoria is a medical sign for a number of conditions, including Coats disease, congenital cataract, corneal scarring, melanoma of the ciliary body, Norrie disease, ocular toxocariasis, persistence of the tunica vasculosa lentis (PFV/PHPV), retinoblastoma, and retrolental fibroplasia. Because of the potential life threatening nature of retinoblastoma, a cancer, that condition is usually considered in the evaluation of leukocoria.